This overgrowth of bacteria produces a biofilm that traps scurf and debris along the eyelashes and harbors bacterial exotoxins along the lid margin. These exotoxins penetrate the eyelid tissue causing low-grade inflammation which adversely affects the tear glands, turning down tear production. Fewer tears containing fewer antibodies allow even more bacteria accumulate and a vicious cycle is established, leading to chronic irritation and dry eye. Since the eyelids are difficult to clean, this overgrowth of bacteria, biofilm, scurf and debris can accumulate over many years, and the exotoxin-induced inflammation can cause significant damage to the eyelid and tear glands. Now, thanks to BlephEx®, your eye doctor can precisely and safely, clean and exfoliate your eyelids and lashes, which will almost immediately improve your symptoms. More importantly, by completely removing the exotoxin-laden biofilm along the lid margin, your doctor can help you avoid the long-term inflammatory damage to your tear glands, preventing chronic dry eye syndrome. 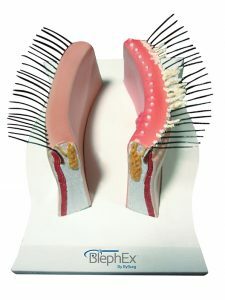 BlephexBlephEx® is a painless in-office procedure performed by your eyecare professional. A revolutionary new patented BlephEx® handpiece is used to very precisely and carefully, spin a medical grade micro-sponge along the edge of your eyelids and lashes, removing scurf and debris and exfoliating your eyelids. Mary. A – I have noticed benefits from BlephEx. No discomfort and my eyes are much better. I don’t experience itching, dryness, and burning. Yes I would recommend this! Gillian B. – My vision was clearer after having BlephEx. The sensitivity and pain stopped. Yes, I do recommend this to everyone. It was such a wonderful experience and it was very simple. Maria G. – With the BlephEx treatment I have noticed that I can see so much more clearly now. My eyelids no longer itchy. My eyes not so dry. This procedure has made a great change in my vision. My comfort is so much better. I was very pleased with my results. 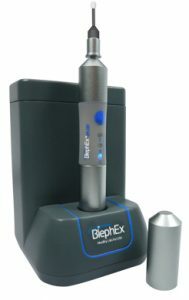 I definitely would recommend BlephEx. It has been so very helpful and the benefits are so wonderful.